Coyote are a medium-sized canine with gray/brown fur found throughout North America. 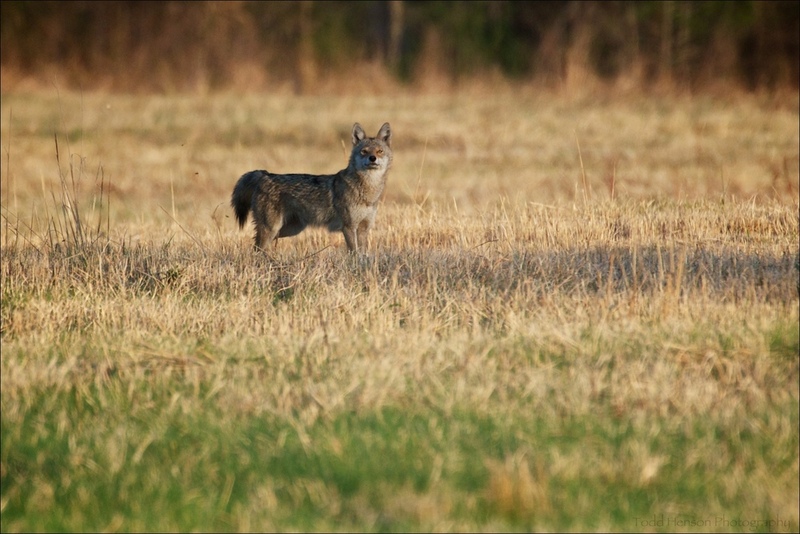 I've read their numbers may have been less prevalent in the past, but as larger predators, such as wolves, have been reduced in number the coyote has flourished. As common as they have become they are not often seen. I've had few opportunities to photograph Coyote. These photos are the best I've managed to make. This particular Coyote was limping on one of its hind legs. It was late afternoon and I was headed out of the wildlife refuge. The Coyote spotted me, and instead of doing as the others I'd seen had done and turning around and moving into the brush, this one watched me, then started following parallel to me, every so often lifting its head to watch me. These photos were made in 2011 and I've not seen a Coyote since then.